Pentagon spokesman Cmdr. Bill Urban declined to comment. "We do not comment on specific PRC weapons tests, but we do monitor Chinese military modernization carefully," Urban told the Washington Free Beacon. The website China Spaceflight reported Sunday that the test would take place, based on the Chinese government announcement of airspace closures along what would ultimately become the zone used by the glide vehicle during the flight test. The website reported that the airspace restrictions were similar to closures announced prior to an August DF-ZF flight test. The airspace was closed to commercial and military air traffic between 12:53 a.m. and 1:40 a.m. Beijing time on Nov. 23—the likely timeframe of the test. U.S. intelligence agencies have assessed the DF-ZF to be a nuclear delivery vehicle for Chinese missiles, with maneuverability and high speeds that would allow it to defeat U.S. missile defenses, currently designed to counter non-maneuvering warheads with more easily-tracked ballistic trajectories. China also could use the DF-ZF for conventional-armed rapid global strike capability, according to military specialists. The vehicle is believed to reach speeds of between Mach 5 and Mach 10, or 3,836 miles per hour and 7,680 miles per hour. The high rate of testing for the glide vehicle is an indication China has placed a high priority on the weapon program and that it is making rapid progress. The Chinese conducted earlier flight tests on June 7, and on Jan. 9, 2014, Aug. 7, 2014, and Dec. 2, 2014. All the tests were first reported by the Free Beacon. The commander of the U.S. Strategic Command told reporters last summer that hypersonic glide vehicles are new strategic warfare technology and an emerging threat. "As I look at that [hypersonic] threat, clearly the mobility, the flight profile, those kinds of things are things we have to keep in mind and be able to address across that full kill chain," Cecil Haney said in an interview in July, using the military term for the process used to target and attack enemy missiles. Air Force Lt. Gen. James Kowalski, then-deputy commander of Strategic Command, said at the same time that hypersonic missiles offer a number of advantages as strategic weapons. "It offers a number of different ways to overcome defenses, whether those are conventional, or if someone would decide to use a nuclear warhead, I think gives it an even more complicated dimension," Kowalski said. Currently, no nation has deployed hypersonic weapons but "it remains something that concerns us," Kowalski added. The annual report of the congressional U.S.-China Economic and Security Review Commission, made public Nov. 18, stated that China’s hypersonic weapons are in the developmental stages and are "progressing rapidly." The glide vehicle could be deployed by 2020, and a separate high-technology ramjet-propelled cruise missile could be deployed by 2025, the report said. The Mach 5 to Mach 10 speeds allow the arms to "strike any target on earth in under an hour," it stated. "The very high speeds of these weapons, combined with their maneuverability and ability to travel at lower, radar-evading altitudes, would make them far less vulnerable than existing missiles to current missile defenses," the report said. The report said China’s hypersonic weapons, as well as the use of multiple-warhead missiles, are part of China’s efforts to assure its missiles can penetrate U.S. missile defenses. 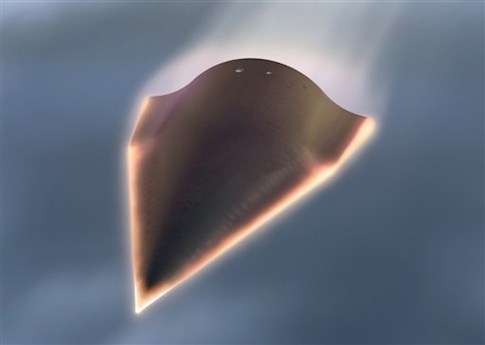 Nuclear-armed hypersonic vehicles would be part of China’s retaliatory strike capabilities, while conventionally-tipped hypersonics could indicate long-range conventional strikes. "Alternatively, China may intend its hypersonic program for both nuclear and conventional purposes, or may simply be following the United States in pushing the technological frontier and is not yet certain which it will pursue," the report said. China is among three nations that are developing hypersonic arms, along with Russia and the United States. Rick Fisher, a senior fellow at the International Assessment and Strategy Center, said the sixth test indicates Beijing may be seeking a conventional rapid global attack capability similar to the developmental U.S. program called Prompt Global Strike. Fisher said analysis of Chinese solid fueled space launchers indicates the new Kuaizhou-2 launcher could be used with China’s anti-satellite missiles and also could boost the DF-ZF to intercontinental ranges. "It is possible that Kuaizhou-2 could become the basis for China's first intercontinental non-nuclear armed Prompt Global Strike delivery vehicle," he said, adding the booster "could likely carry multiple DF-ZF derived hypersonic maneuvering precision strike warheads." China also is building and deploying sophisticated surveillance satellites that could be used for the precision global strike weapons. With some 138 satellites in space by 2030, "this means that an intercontinental [Prompt Global Strike] launched from China against U.S. targets could benefit from multiple target location updates," he said. Since China has refused to negotiate limits on its strategic weapons and remains highly secretive about all its arms programs, "the safe course for Washington would be to avoid any further delay in developing its own Prompt Global Strike capability to deploy if China does the same."